The 2010 Brickvention Lego Convention was brilliant. Click to view some of the awesome lego constructions that were present. So – my exhibit at Brickvention 2019 wasn’t quite at the level of my Stormtroopers from last year (which I just realised I didn't even blog about! ), but there’s a reason (or at least and excuse). Turns out that the application to exhibit were due months earlier this year, and somehow I’d missed the notifications. In fact, it was only because a friend happened to mention that the already extended deadline had just expired that I knew anything about it. My application went in the day after it closed – and thanks to the unexpected rush, I didn’t have any of my ideas ready to go. When you exhibit at Brickvention you need to apply with details of your exhibit so they know how much space you’ll need, and if it will fit the show etc (and to make sure there aren’t too many duplicates etc). So the only thing I had done any work on at that point was a Fabuland display. So that’s what I applied to exhibit – and it was accepted. Now, Fabuland was a theme from the 80s that lasted about 10 years, and had animal characters instead of mnifigs, and was aimed at younger kids. The pieces were generally larger, so the builds were easy. 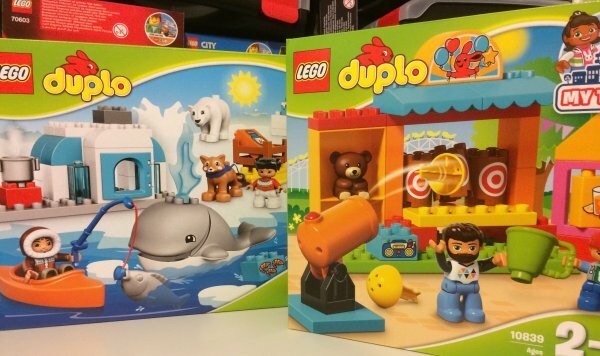 It’s the same approach that Lego uses today in the Juniors/4+ range. Anyway, a while back one of our local exhibitors decided to show some Fabuland at a show in Hobart. So I knocked up the above pub diorama to go with it. I enjoyed the mix of the extremely kid friendly figures with the more adult setting of a pub. Edward the Elephant was the star of a TV series that accompanied the original Fabuland theme, so I made him a bar tender at Eddie’s Bar, which was a Hustle reference (which I think no one ever got). I also had a group of dogs playing cards in homage to a famous paining (of dogs playing cards). And the racoon happens to only have one arm – so he was playing the pokies. That was the original build, it was just a small diorama but I enjoyed it, so had been toying with the idea of a bigger display. The original idea was that this Fabuland city would be after the economy had collapsed. So I was going to have a Centrelink office with a queue going in, and a smaller queue going out into the pokies at the local pub. The bank was going to be boarded up and closed, while next door a loan shark would be operating. There was going to be more crime, depression, and I was going for the feeling of a town where the money has dried up. That was the initial plan anyway – but once I started building, the character of the Fabuland minifigs ended up swaying me away from that. There are still quite a few elements, but it’s might lighter than I’d originally intended. There’s still a queue waiting at the Centrelink office (the sticker on the window is hard to read). But the poor overworked bulldog inside is doing his best to help his clients. Next door to Centrelink is Pork Chop’s butchery. This was just my sense of humour with a pig running a butchery. I’d always intended for there to be a bikie gang in town – and it ended up being populated by Fabuland birds. I thought of them as Hell’s Avians. I also enjoyed mixing Fabuland figures with more recent animals. A rabbit family. The joke here is pretty obvious. Another hang-over from the earlier idea, this racoon is carryingn spray paints to tag buildings, while the police are driving around in a comical scooter with one riding in the tray. The loan shark still made it into this version – although the closed bank did not. In addition to his collection of wares to peddle, Max the rat also has a full sized mounted shark in his store. Eddie’s Bar also returned – this time as a much expanded part of the display. The bar is much more detailed, but basically the same as my original version. And the dogs playing cards was basically lifted from one to the other. There were a number of booths with people enjoying a drink, and I was quite happy with the way this small pool table came out. And of course, the pub still has the pokies. I had built the timber frame to transport it all and was expecting to just varnish it – but my awesome sister volunteered to paint it, which really transformed the model. Thanks heaps Em! Compared to some of my other displays (particularly last year) this was a very basic and rather boring display – but it still got a decent amount of love from the visitors. Kids enjoyed the animals and the stories in the display (glad I toned it down) while some of the adults remembered them from their childhood. It also turns out that 2019 is the 40th anniversary of the release of Fabuland – so it was rather appropriate. Hopefully next year I’ll be a bit better prepared. 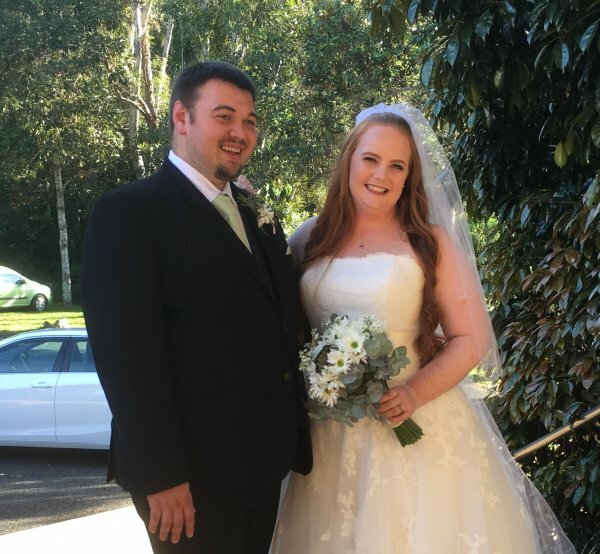 So my cousin (one of my best mates), Klutz, got married last weekend. He married Chrissie, who I only met just a few days before the wedding, but she’s awesome and you could easily tell how in love they were. Anyway - Klutz asked me to be his best man. I did a very poor job of giving a speech (sorry mate). Even after I finished rushing through the speech my hands were still shaking for fifteen minutes or so. It’s a much better speech in text than it was when I actually gave it. So below is the speech as it should have been. Massive congrats to Clinton and Chrissie - you’re both awesome! A few months ago I got a call from Clinton asking me to be a groomsman. Of course I was happy to say yes, and secretly I was going "YES, HE DOESN’T WANT ME TO BE THE BEST MAN, I DON’T HAVE TO DO A SPEECH!" Then a month or so later we were talking about suits and the difficulties of having even the closest groomsman over 170km away, not to mention myself over 2000 ks away back in Tassie. As part of the conversation I asked who the best man was. There was a pause - "it’s you, didn’t I mention that?" So here is the speech. Now, before I go on, I should apologise. No matter how hard I try to say Clinton, I’ll end up calling you Klutz. I’m not sure where the name Klutz started, but Clinton has run with it and gone by that name online for many years now. It’s so prevalent that even my parents (his Uncle and Aunt) refer to him as Klutz, much to my sister’s annoyance, who doesn’t think it’s appropriate behaving for an Uncle. To me, you’re just Klutz, even on your wedding day. We’ve been mates for almost as long as we’ve been cousins. And many years ago you told me who you were going to marry. You probably don’t remember it, but I’m pleased to see you standards have improved. Chrissie is a much better choice than Sailor Moon! Klutz, you do know that the green bits in the shower aren’t meant to be there right? You may have your work cut out for you there Chrissie. Now, I’m not sure who will be doing most of the cooking, but it might be good to know that Clinton’s favourite vegetables are (or at least were) Ham and Cheese. Now at least today there wasn’t much chance of Clinton falling asleep in the middle of things, but at a regular church service, that was a real risk. And when Klutz falls asleep, it isn’t quiet! One of my tasks when Klutz was living in Tassie was to keep an eye on him when he was at our church and poke him when he started to snore. Except one time at a church camp where he ended up sitting on the other side of the room. The people there didn’t really know him very well and weren’t game to wake him up when he started to snore. The minister looked a bit annoyed, but raised his voice and kept going with the sermon until someone eventually gave Klutz a poke and woke him up. The point of all this is, it’s now your job to keep him awake in church, and I hope you’re a deep sleeper. You’ve probably already noticed this, but sometimes you have to tell Klutz the same thing over and over again before he gets it. Don’t drive on the lawn Clinton. Don’t drive on the grass Klutz. 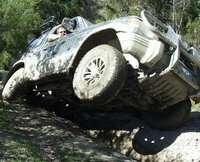 And sometimes you just have to tow him out after he’s driven on the grass and gotten bogged. And the wheel ruts last for years. But he does get the message eventually. I’ve known Clinton since he was born basically, and I’ve known Chrissie since Wednesday, but they’re an awesome couple. So Chrissie, welcome to the family. And Klutz, massive congrats, Mate. 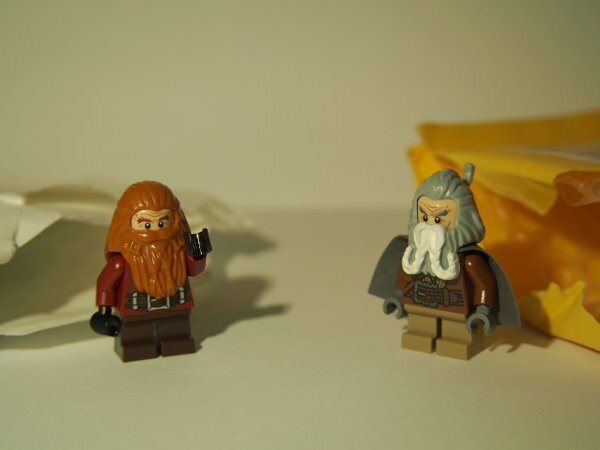 On exactly the same day, two dwarves arrived in the post. Gloin travelled from Thailand, while Oin came all the way from the USA. Amazing that they timed their arrival so well. And with these two finally in my possession, I now have both a complete Fellowship of the Ring and a complete Thorin's Company. I'm getting ready for this whole "Being an Uncle" malarky. Congrats to Em and Turks - it's officialy public news now, so I don't have to keep secrets anymore. I can't wait to be a crazy Uncle. So - this was my main MOC for Brickvention 2017. It’s not overly large, but I’m quite proud of it. For anyone who is unfamiliar, that’s the gate-room from StarGate Command (from the tv show Stargate). 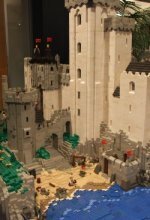 The story of this MOC (which is LEGO for My Own Creation - it means a creation that wasn’t built from instructions) starts at Brickvention last year. 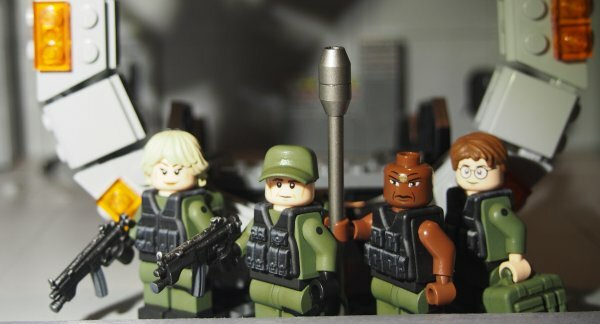 I was doing my check of the sellers stalls before I decided where to spend my money, and I saw a group of custom SG-1 minifigs. I decided to buy them, but did another lap of the stalls first, and by the time I got back, they were gone. So that would have been the end of the story, except the guy behind the stall was the guy who’d actually painted the figs, and he offered to do me a set on commission. Brilliant. So a couple of months later, my minifigs arrived, custom painted by Terry Jeffries. Awesome job mate, thanks again! All I had was the SG-1 team at this point, but they were awesome. They made a brief appearance in Brendon’s Endor layout at one of the Tassie shows (very few people noticed them - the camouflage uniforms were working) - but I had bigger plans. 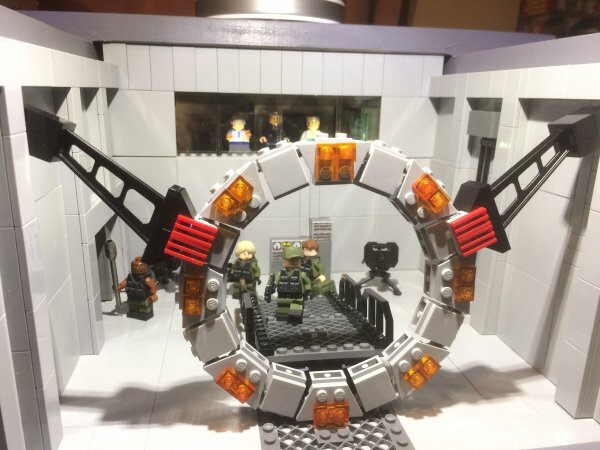 You can’t have SG-1 without a Stargate! 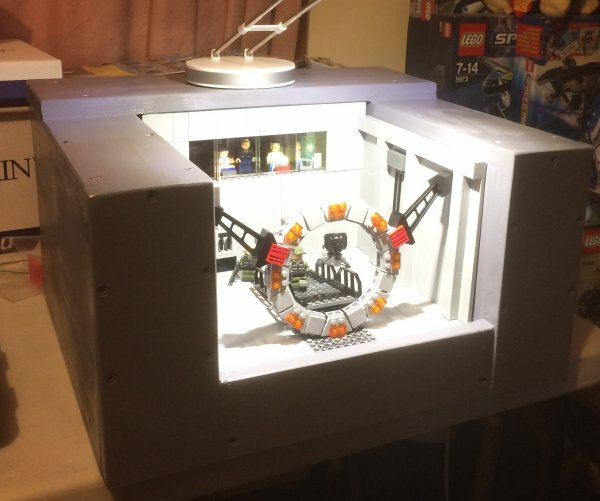 So I did a heap of Googling to see how other people have done Stargates in Lego. There are many different approaches that people have taken. Some very awesome ones actually spin, but those are in totally the wrong scale for minifigs. In the end, mine is based on an idea by a guy called Yatkuu. It’s not identical, but it’s pretty close. So that gave me the team and a stargate - the next time they appeared on Endor they had a stargate, and suddenly people were pointing them out. 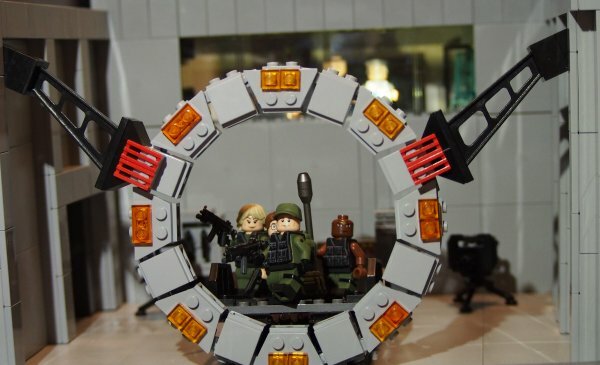 But I wanted more than a gate - I wanted to do a display of Stargate Command. That’s not an original idea either - quite a few people have done gaterooms, to better or lesser results. No one had done quite what I wanted to do. I wanted to look up through the gate towards the briefing room. This is backwards to the most common angles from the TV show, and backwards to all the MOCs I could find. I started prototyping. I wanted to save money by using baseplates for the walls and supporting it all with timber. I wanted the walls to have texture though rather than just being flat - so it took quite a while to get it all sorted. In the initial prototypes, the briefing room was much lower than it ended up. 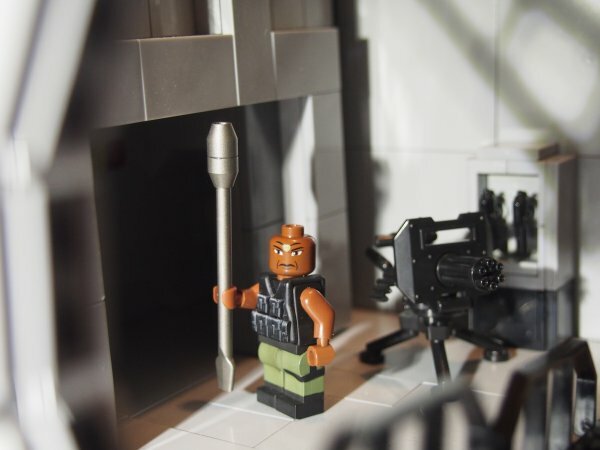 I didn’t have any minifigs for General Hammond and the technicians, so they were scrounged together. General Hammond is wearing a train conductors uniform, but it looks enough like an airforce uniform that I think it works. 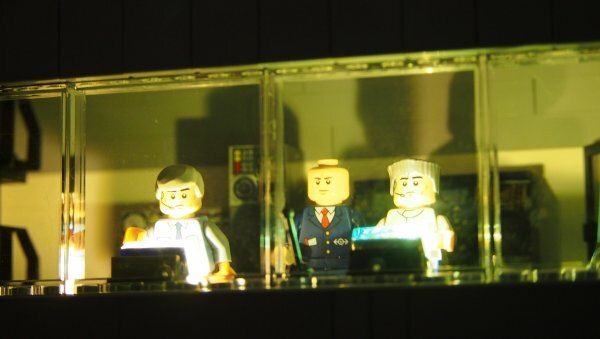 I also installed some lights from lightmybricks (https://www.lightmybricks.com.au/) to light up the computer panels and give the control room some light. This makes the guys inside visible, and I think it gives a nice effect. The timber frame had to be solid enough to protect the display during transport and storage, and the wings had to be large enough to include the hidden corridor on the left side. Determining just how large to make them took a surprisingly long time and a number of prototypes before the final timber construction project. It was on display in Brickvention in Melbourne and got a lot of positive comments and had it’s photo taken MANY times. 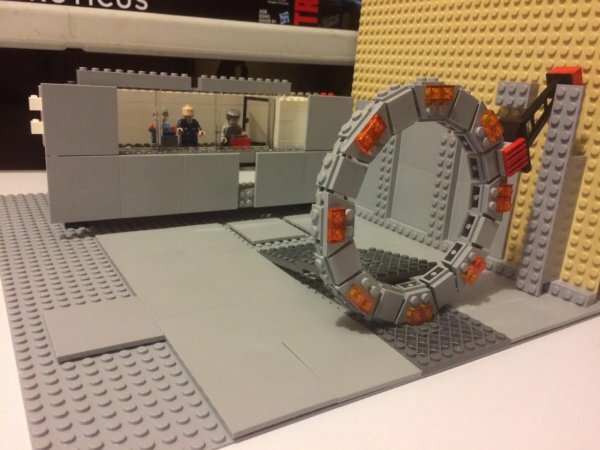 I’ve discovered that kids have no idea what Stargate is and all assumed it was something from Big Hero 6 or the Flash, but 90% of parents knew what it was. Even Luke McGregor (from Rosehaven and Utopia) came to check it out. Dial the gate - I’m out of here!